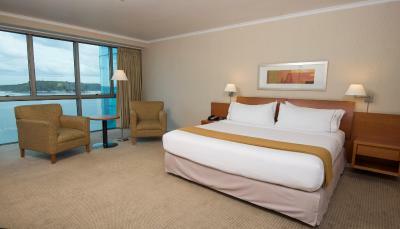 Lock in a great price for Holiday Inn Express - Puerto Montt - Patagonia - rated 8.9 by recent guests. Very friendly and helpful staff. Great breakfast options. 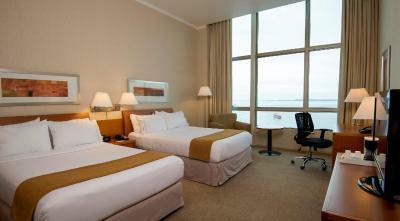 great location, big rooms, some with ocean view, clean and good quality of bed and pillows. Modern bathroom. We went to visit several locations in south of Chile, was a great headquarters. 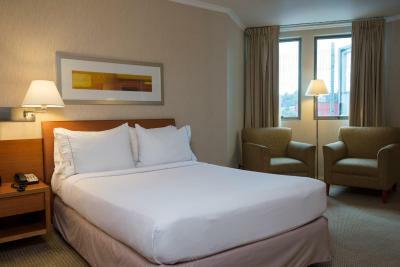 They have a great breakfast (included), complimentary wifi, confortable and clean rooms. The hotel share the same building with a mall, so you have access to buy groceries and food court. The location is really good as we were in a mall with supermarket and all that we needed such as restaurants and exchange store. The city was not nice but attend our objectives to be close to Chilloe Island. It was a good experience in general. Excellent view of the sea. Helpful staff. Big room. Good location with sea view. Big rooms, great value, excellent breakfast. Staff helpful and welcoming. 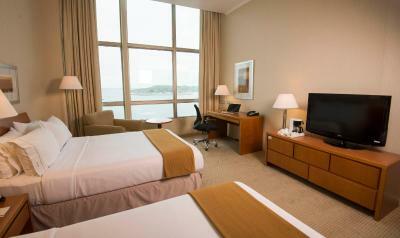 One of our top picks in Puerto Montt.The Holiday Inn Express is located in the centre of Puerto Montt. 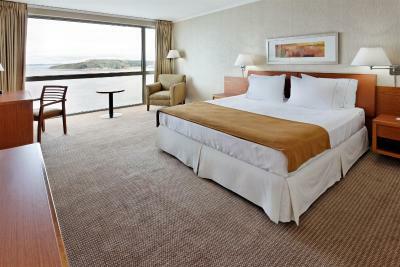 It offers modern interiors, comfortable rooms and panoramic ocean views. 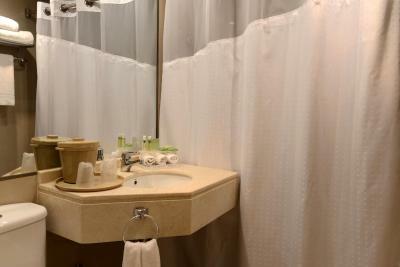 Guests can enjoy the hotel´s gym and sauna. 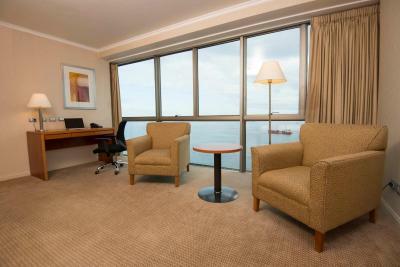 The spacious rooms at the Holiday Inn Express Puerto Montt are all equipped with a 37-inch LCD and cable TV. 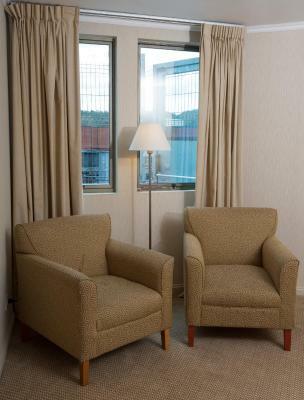 Additional features include a tea and coffee maker, separate work desks and free Wi-Fi. Guests at the Holiday Inn Express can enjoy a daily breakfast buffet serving fresh fruits, juices and rolls. 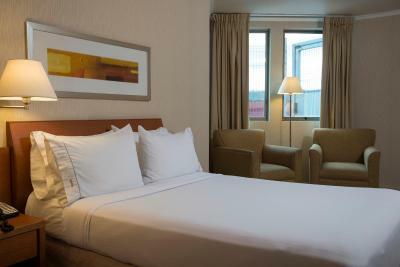 For dining options the hotel is located within walking distance of several restaurants, and guests can inquire which restaurants accept a direct room charge. 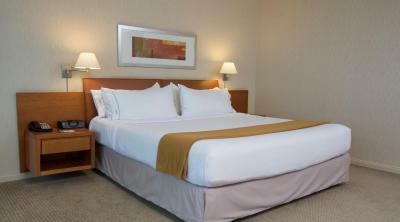 Located in the Los Lagos region, the hotel is only 5.6 miles from El Tepuel Airport. Free on site parking is available. 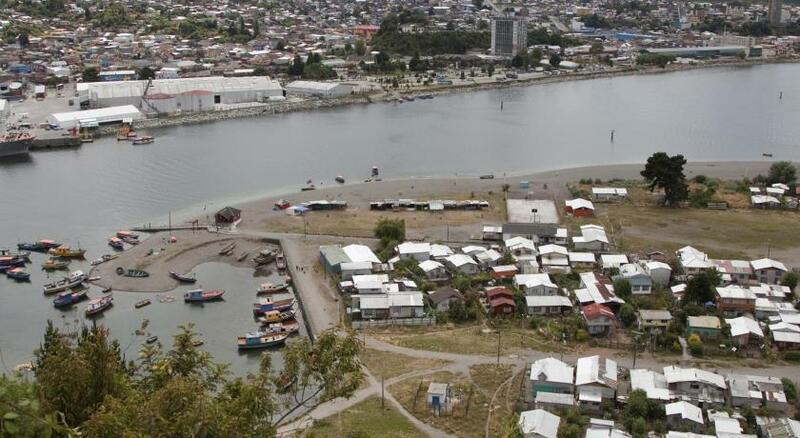 This property also has one of the best-rated locations in Puerto Montt! Guests are happier about it compared to other properties in the area. 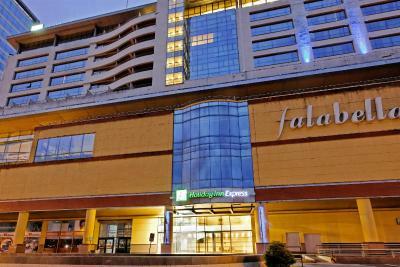 Holiday Inn Express - Puerto Montt - Patagonia has been welcoming Booking.com guests since 10 Dec 2010. 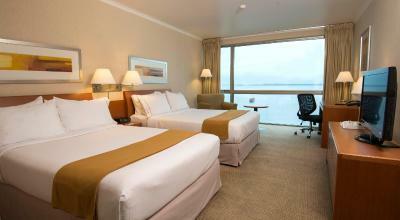 When would you like to stay at Holiday Inn Express - Puerto Montt - Patagonia? 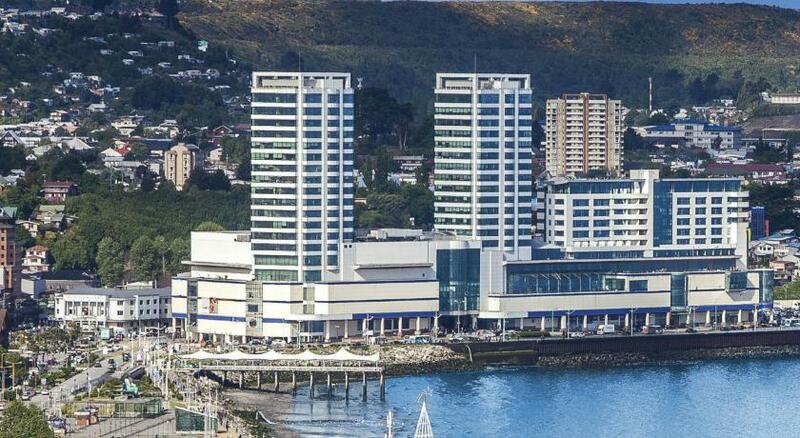 House rules Holiday Inn Express - Puerto Montt - Patagonia takes special requests - add in the next step! 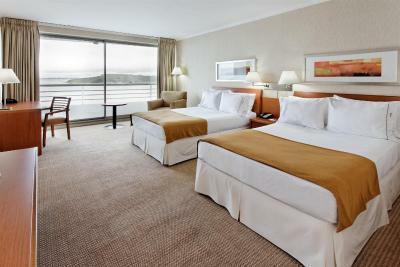 Holiday Inn Express - Puerto Montt - Patagonia accepts these cards and reserves the right to temporarily hold an amount prior to arrival. Parking could be a little difficult. No hot water to shower on one day. Lost internet in the front entrance area, just when we needed that capability. I couldn’t find anything that I didn’t like. I love this hotel so much! We are passing through after a few days in Santiago and Atacama, it has been an amazing stop. 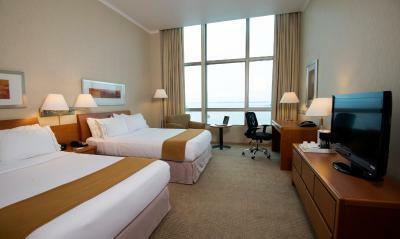 The beds are comfortable, the hotel is quiet, the view is amazing, the breakfast was delicious. We are very happy with this stay. no room service no restaurant but they have a ncie breakfast, and a coffe shop with some hot meal options. Amazing views from the room. Great breakfast. Only one, or no coffee bags, no creamer, no tea bags, no bottled drinking water, no TV guide in the room. No engl. channels (spanish only). Many internet problems. typical holiday in product very efficient not character. 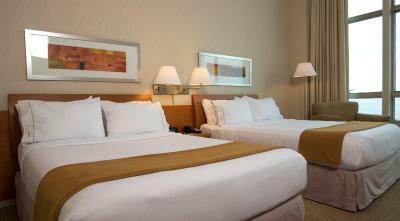 The room is specious and clean the bed wide and very comfortable. breakfast fine modern building. no kitchen or a restaurant in the hotel but they have a coffe shop with some hot meals options. The rooms haven't a free bottle of water or tea bags. Parking is a bit hard to find as it is shared with the mall. In the evening the mall goers clear out and then you can park right near the hotel entrance. This hotel has one of the best views. 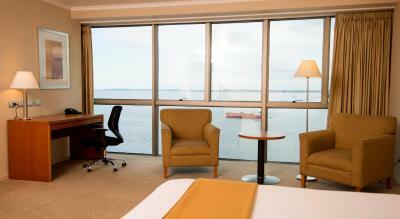 It is right on the water and every room has a view. The rooms were big and very clean. Breakfast was wonderful with lots of options and plenty of seating. The WiFi worked well and easy to logon. The hotel is attached to a mall which also has a supermarket. They also provide free parking. They also have a washer and dryer (4.000 for wash+dry). This was by far the best Holiday Inn we have ever stayed in. For Chile the price is a bit on the highlight side but we enjoyed our stay. I would like stay there the next time we are in town. Several maintenance issues, however: carpet could use a good cleaning, bathroom trim needs repainting, several electrical outlets/covers were loose. 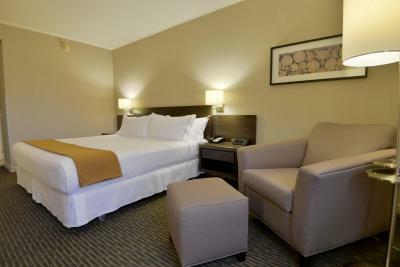 Room was clean with contemporary design and furnishings. Breakfast was ample and good variety. Staff were friendly, helpful, and bilingual. Location and parking are excellent.